Using ceremonies rooted in tradition, truth-telling bonfires and traditional cleansing, Fambul Tok (“Family Talk”) emerged in Sierra Leone as a unique community-owned program bringing together perpetrators and victims of the violence in Sierra Leone’s eleven-year civil war to talk, heal, and chart a new path forward, together. Ishmael Beah is a writer, advocate, and author of the acclaimed book, A Long Way Gone: Memoirs of a Boy Soldier. Born in Sierra Leone in 1980, at age thirteen, he was forced to become a child soldier and fought for three years before being rescued by UNICEF. Beah moved to the United States in 1998 and finished high school at the United Nations International School in New York. In 2004, he graduated from Oberlin College with a B.A. in Political Science. A member of the Human Rights Watch Children’s Rights Division Advisory Committee, Beah has spoken before the United Nations, the Council on Foreign Relations, the Center for Emerging Threats and Opportunities (CETO) at the Marine Corps Warfighting Laboratory, and numerous conferences on children affected by the war. His writing has appeared in Vespertine Press andLIT magazine. He lives in New York City and returns regularly to Sierra Leone to help former child soldiers repatriate in their communities. 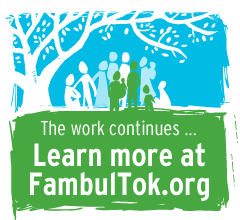 John Caulker co-founded the Fambul Tok program in late 2007 and is Executive Director of Fambul Tok International. A human rights activist in his native Sierra Leone since the beginning of the civil war, Caulker risked his life to document wartime atrocities for international NGOs such at Amnesty International and Human Rights Watch. He founded the human rights NGO Forum of Conscience (FOC) in 1996, and as Executive Director of FOC, also served as national chairman of Sierra Leone’s Truth and Reconciliation Commission (TRC) Working Group. He lives in Freetown, Sierra Leone. Libby Hoffman is a co-founder of Fambul Tok and President of Fambul Tok International. She has worked in international peacebuilding for over 20 years as a professor, trainer, program designer, and funder. She founded Catalyst for Peace in 2003 as an operating foundation working to support community-led and owned peacebuilding. She is the Executive Producer/Producer of the Fambul Tok film, and lives in Portland, Maine. Sara Terry is an award-winning photographer and journalist who focuses on post-conflict issues, whose work has appeared in the New York Times Magazine, Fast Company, and Rolling Stone, among other outlets. Her work about the aftermath of war in Bosnia led her to start The Aftermath Project, a non-profit grant program which supports photographers covering the aftermath of conflict. She is the producer-director of Fambul Tok (the film), her first feature length film. She lives in Los Angeles, California and can sometimes be heard as a guest host for the NPR radio program To The Point. Benedict F. Sannoh is the Chief Human Rights Officer of the United Nations Mission in Sudan (UNMIS) and a distinguished lawyer, activist, and scholar. Prior to UNMIS, he worked as Chief of the Human Rights Sections in UNAMSIL, UNIOSIL, and UNIPSIL in Sierra Leone, helping to consolidate peace by advocacy and building national capacity to promote democracy and human rights. In Liberia he served as a law professor, and human rights activist, and founded the Liberian Center for Law and Human Rights. He currently serves on the advisory board of Fambul Tok International. 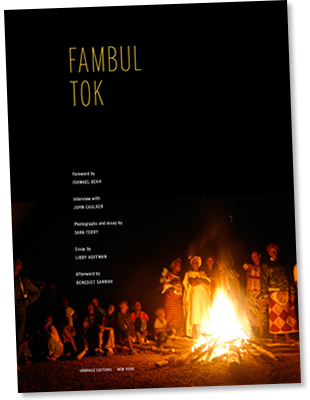 To order your copy of Fambul Tok, click here.